Helen Shear (USFS) in 1992. The United States Congress designated the Tebenkof Bay Wilderness (map) in 1980 and it now has a total of 66,994 acres. All of this wilderness is located in Alaska and is managed by the Forest Service. 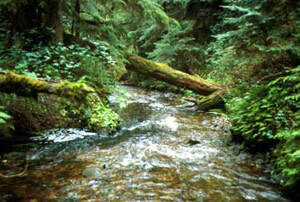 The Tebenkof Bay Wilderness is bordered by the Kuiu Wilderness to the south. Tebenkof Bay Wilderness, located on Kuiu Island, comprises a complex system of smaller bays, where islands, islets, and coves are the prominent features. The western side is bound by Chatham Strait, a body of water exposed to the open ocean. The waters of the bay are home to sea otters, humpback whales, harbor seals and four types of salmon, while the land is covered by a thick forest of old growth, muskeg and alpine areas. Historically the Kake and Klawock Tlingit utilized Tebenkof Bay. They trapped, hunted, fished, gathered seaweed and gardened throughout the area. The bay was named in 1879 for Captain Tebenkov, governor of the Russian American colonies from 1845-1850. Early into the 20th century, canneries and salteries expanded into the coastal waters of what is now Alaska, and at least one of the industries operated within the bay during those formative years. At about the same time, the commercial raising of fur-bearing blue foxes spread. Almost every island group within Tebenkof Bay sheltered one of these businesses, but most were abandoned in the early 1940's. Commercial fishing continues inside the bay and in the outside waters. Planning to Visit the Tebenkof Bay Wilderness? How to follow the seven standard Leave No Trace principles differs in different parts of the country (desert vs. Rocky Mountains). Click on any of the principles listed below to learn more about how they apply in the Tebenkof Bay Wilderness.